I haven't posted much lately because I was out of town visiting relatives for Thanksgiving. During the five days I was gone I did very little birding. 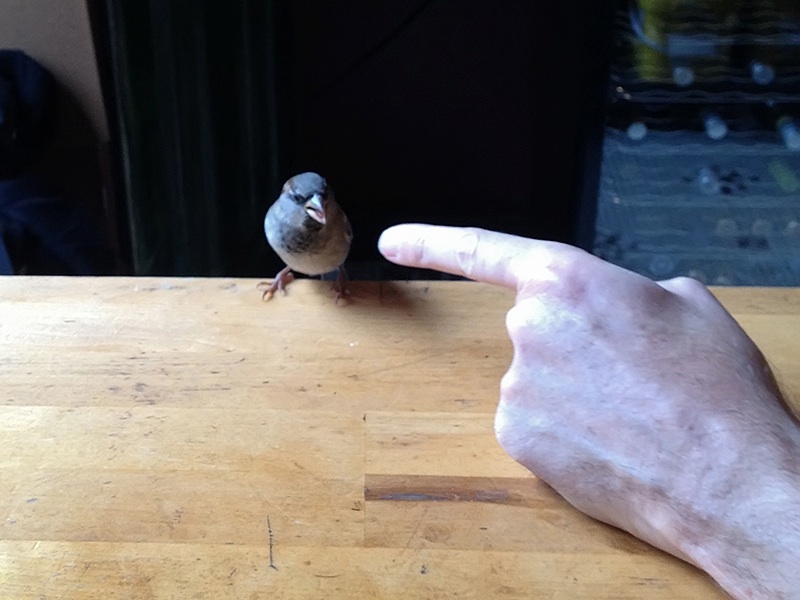 On Sunday, however, Robin and I stopped in at a Brooklyn coffee bar for a caffeine fix where I was promptly harassed by a bird that refused to be ignored. Sunday, December 4, 2011, 10 a.m.
"Waterfowl on the Terminal Moraine"
Focus: Salt and Freshwater Waterfowl, in various locales in Brooklyn, Queens, & possibly Nassau County west. 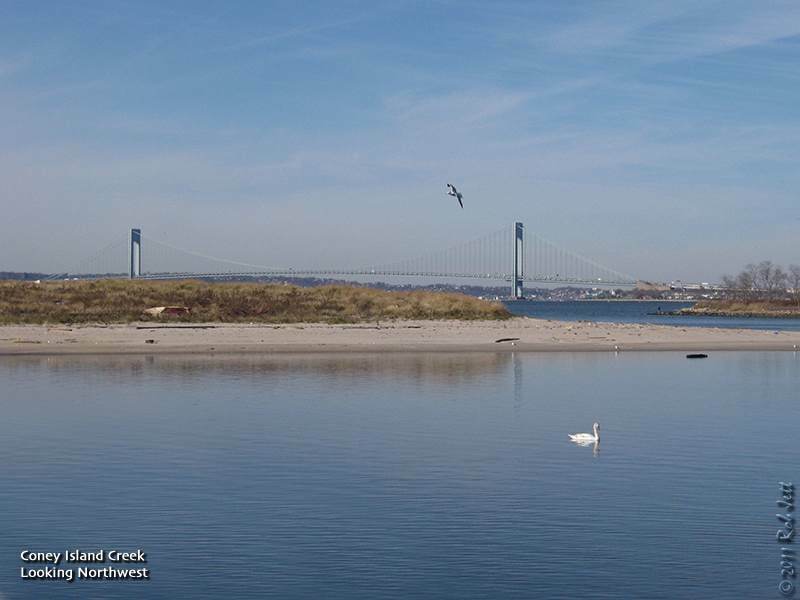 Guide: Gabriel Willow Come explore the lovely coves and rocky outcroppings of Pelham Bay Park, looking for the wintering ducks that find shelter there, as well as migrating raptors and other winter visitors. Bring lunch, water, and binoculars. Transport by passenger van included. Limited to 12. $75 Click here to register! 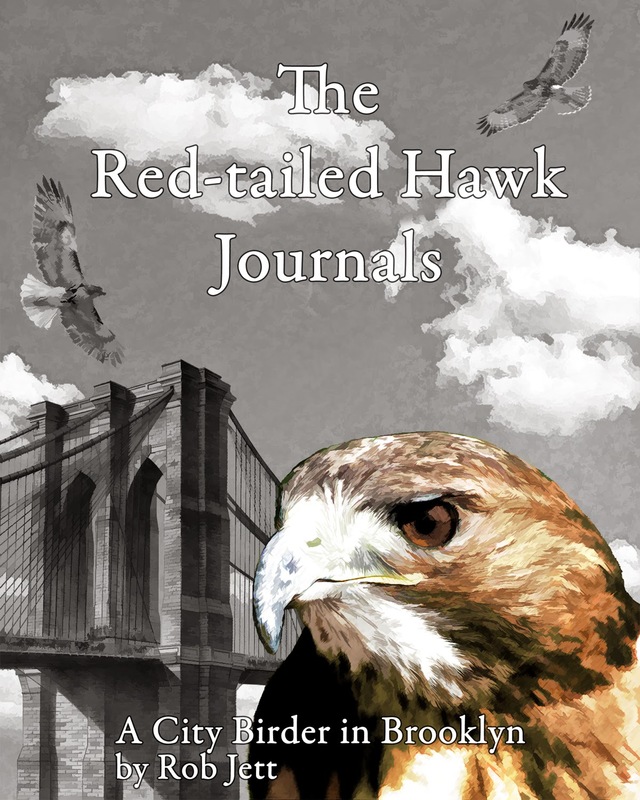 Guide: Gabriel Willow Free to Members at the Family and Supporter Levels Take a trip to Fort Tilden and Floyd Bennett Field to search for wintering raptors, ducks, and other waterfowl. Transport by passenger van is offered toa limited number of guests and will leave Manhattan at 8am, returning by 1pm. Please call 212-691-7483 to register. Van limited to 11 people; walk limited to 20. 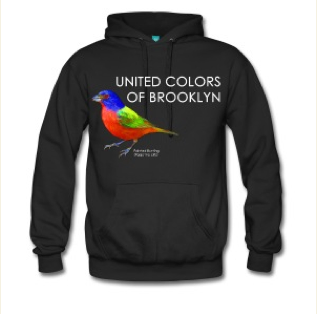 Free to members only at the Family and Supporter levels. We’ll follow the multi-use trail overlooking Fresh Kills, pass the famous Hessian Spring as it crosses the path and view Fresh Kills estuary and work our way to the remains of Ketchum’s Mill. Along the way we’ll observe traces of the past, examine the present woodland ecosystems and search for evidence of present inhabitants especially deer and other mammals. Park at the start of Old Mill Road alongside the church. Sunday, December 4, 2011, 9 a.m. to 11 a.m.
Hurricane Irene has changed Wolfe’s Pond into a tidal creek, a new habitat attracting an assortment of new wildlife. Late migrating shorebirds and sparrows, as well as wintering waterfowl, will busy themselves feeding among this diverse ecosystem. Meet in the main parking lot beside the restrooms. 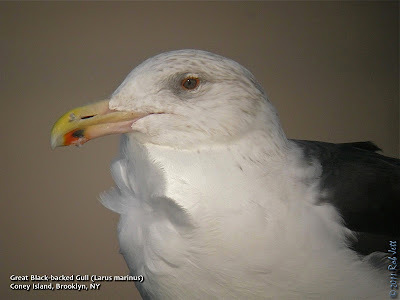 The Great Black-backed Gull is one of four common gull species found around New York City (laughing, ring-billed and herring being the other three). The largest gull in the world, their wingspan can reach nearly six feet. These opportunists feed on everything from small fish to refuse. I've also seen one kill and eat a Laughing Gull. 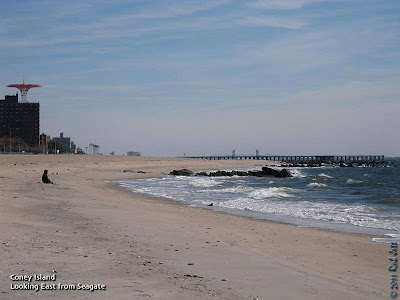 Last weekend I spent time at Coney Island doing my typical winter route - walking from West 8th Street, west, to the pier, over to the jetty at the edge of Seagate, then north to Coney Island Creek Park and along the creek's edge to Mark Twain High School. I was hoping to find some arriving winter seabirds. A strong southwest wind was kicking up the surf making finding birds bobbing in the water challenging, at best. There looked to be lots of gull activity at the inlet adjacent to Breezy Point, but nothing really identifiable at that distance. I did spot a few Bonaparte's Gulls near the jetty at the western end of Coney, as well as, a small number of Northern Gannets offshore. Two Purple Sandpipers were also seen clinging to the rocks at the end of the jetty. My real hope was to locate at least one White-winged Scoter for the year, but as you can see from this photo, the water was pretty rough. I could make out some flocks of dark waterfowl way off in the distance, which were likely scoters, but again, nothing I could clearly identify, so I headed over to the north side of the peninsula where there would be less wind. 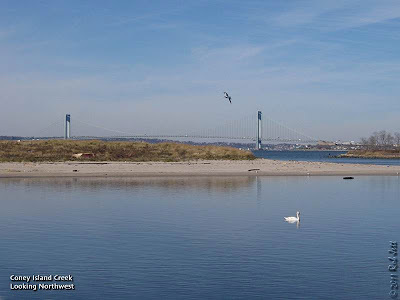 Gravesend Bay and Coney Island Creek were glass calm compared to the south side of the peninsula. Unfortunately, there wasn't much in the way of wildlife there either. There were the usual mixed flocks of Canada Geese, Mallards, black ducks and Mute Swans, plus a few Buffleheads. As I headed towards the soccer fields at Leon Kaiser Park I noticed one bird a little out of place on the creek. It was a Red-throated Loon. These birds are currently migrating through the area and I guess this bird decided to get out of the wind and rest. He actually had his eyes closed most of the time that I was watching him. "Expanses of glass strategically placed to make the most of the sun’s light and heat are invisible to birds. Rain gardens and trees planted around green buildings attract birds and make collisions more likely. 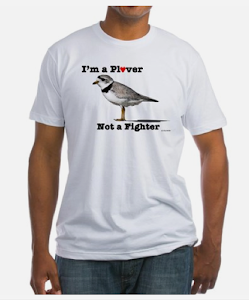 As many as one billion birds die in building collisions in the United States each year." Green buildings usually conjure images of super-efficient, high-tech constructions, not stunned or dead birds. Unfortunately, some of the buildings that rate highest in energy efficiency and other green factors are also among the biggest bird killers. Expanses of glass strategically placed to make the most of the sun’s light and heat are invisible to birds. Rain gardens and trees planted around green buildings attract birds and make collisions more likely. As many as one billion birds die in building collisions in the United States each year. While cities like San Francisco and Chicago have developed guidelines for creating safer cities for birds, bird-friendly attributes are also now getting attention from the United States Green Building Council‘s LEED certification program, the nation’s standard setter for green construction. Thanks to a campaign by the American Bird Conservancy and the Bird-Safe Glass Foundation, builders and designers will soon be able to earn credit toward LEED certification by featuring design elements that mitigate feathered fatalities. The credit is being tested by the program’s Pilot Credit Library to make sure that it is effective.before it becomes part of the permanent LEED guidelines. 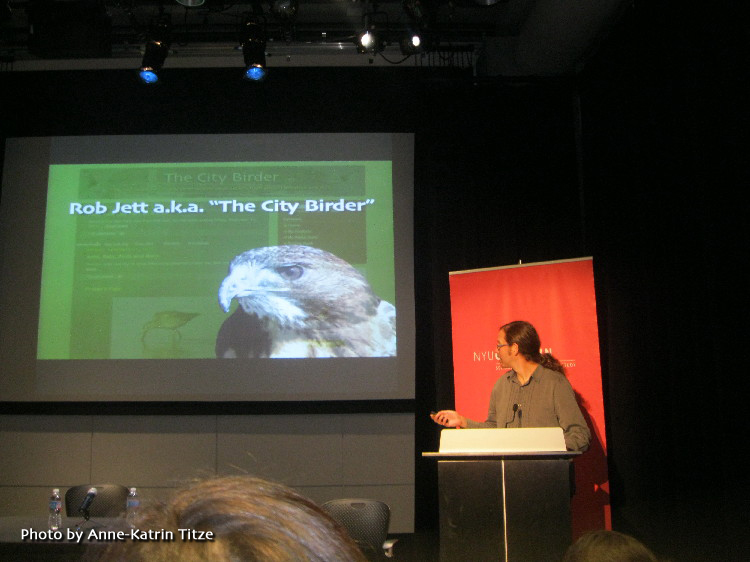 The "Wild NYC" panel at New York University last week went very well. After my presentation, Wildlife Rehabilitators Bobby and Cathy Horvath wrapped up the evening with a selection from their rescued animal menagerie. Diurnal raptors included American Kestrel, Peregrine Falcon, Red-tailed Hawk and Rough-legged Hawk. Nocturnal raptors on display were Barn Owl, Eastern Screech Owl, Barred Owl and Eurasian Eagle Owl. Another bird was a one eyed Common Raven. Bobby also explained to the audience the background of several other rescues in their charge - a Striped Skull, a blind Opossum, a Kinkajou and a young Fennec Fox. Francois Portmann has some really great photos of the birds on his website here. Sunday, November 27, 2011, 10 a.m.
Trip Leader: There is no designated leader for this walk; birders can meet at the time designated and walk as a group this holiday weekend. Greetings. 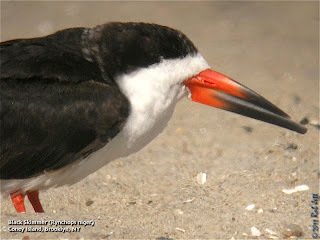 This is the New York Rare Bird Alert for Friday, November 18th 2011 at 10pm. The highlights of today's tape are RUFOUS HUMMINGBIRD, BROWN PELICAN, SANDHILL CRANE, EARED GREBE, BLACK-HEADED GULL, NORTHERN SHRIKE, GREATER WHITE-FRONTED GOOSE, EURASIAN WIGEON, MARBLED GODWIT and DICKCISSEL. It was a good week again and we should now be on the lookout for the PINK-FOOTED GOOSE found Tuesday in Montgomery, Orange County, but not seen lately and for SNOWY OWLS already appearing in Connecticut and New Jersey. The immature female RUFOUS HUMMINGBIRD was still visiting the feeders at Lenoir Preserve recently. To reach this site in Yonkers, Westchester County, from the Sawmill River Parkway take Exit 9, Executive Boulevard, to its end at North Broadway and go right on North Broadway a short distance to Dudley Street on the left. The Lenoir parking lot is on the left off Dudley Street. The hummingbird has been in the butterfly garden and please make sure that the gate to the garden remains securely closed. BROWN PELICANS also continue in the region. 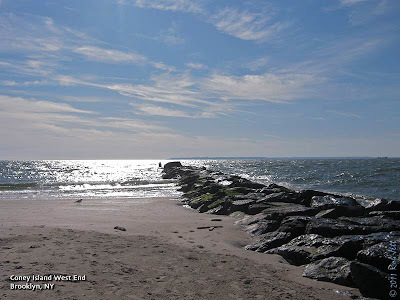 A surprise 2 hour visit was made by one at the Reade Sanctuary / Playland Park in Rye, Westchester County, last Sunday morning and 2 were seen together around Montauk Harbor Inlet and a little farther west at Fort Pond Bay last weekend. Another Westchester rarity involved 4 SANDHILL CRANES moving north over the Chestnut Ridge Hawkwatch at the Butler Sanctuary in Bedford Thursday afternoon. 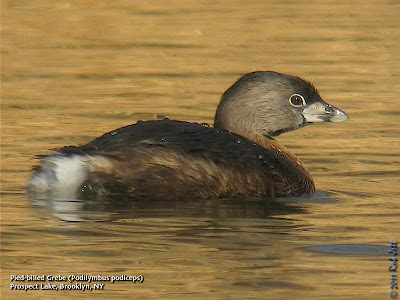 The EARED GREBE at Jamaica Bay Wildlife Refuge was in Jamaica Bay south of the West Pond trail at least through Tuesday where it has been staying with a dozen or so Horned Grebes. An adult BLACK-HEADED GULL visited the Mill Pond in Setauket from Saturday through Monday and one presumably continues in the vicinity of the Owl's Head waste water treatment plant in Brooklyn though it has also been missed there. An immature NORTHERN SHRIKE found Saturday at Smith Point County Park in Shirley was present around the picnic area west of the entrance road up through Monday but has not been reported since. Two drake EURASIAN WIGEON were uncovered last weekend. One was present Saturday and Sunday on Cooper's Neck Pond in Southampton and the other spotted Sunday on Patchogue Lake in Patchogue was still there Wednesday and both likely continue. A few GREATER WHITE-FRONTED GEESE remain regionally. One at Van Cortlandt Park in The Bronx present last weekend should be looked for on the Parade Grounds or on the lake. Two White-fronteds have been feeding on the Further Lane field in East Hampton, another continues on the south pasture at the Deep Hollow Ranch east of Montauk and one was seen again on Marratooka Lake off New Suffolk Avenue in Mattituck last Saturday morning. At Jones Beach West End the shorebirds that gather at high tide on the bar off the Coast Guard Station still featured 2 MARBLED GODWITS at least to Tuesday and the DICKCISSEL found Sunday with House Sparrows around the Coast Guard Station hedgerow was still present today. Twenty-five or so COMMON EIDER have been around Jones Inlet recently. Birds at Jamaica Bay Wildlife Refuge besides the Eared Grebe include a RED-NECKED GREBE in the bay last Saturday, 240 SNOW GEESE with a Blue Goose at the East Pond last Sunday evening and a growing number of other waterfowl. Also of note at the Hess Station on Cross Bay Boulevard north of the Belt Parkway a VIRGINIA RAIL was running around the gas pumps last Sunday evening probably having spent the day there. 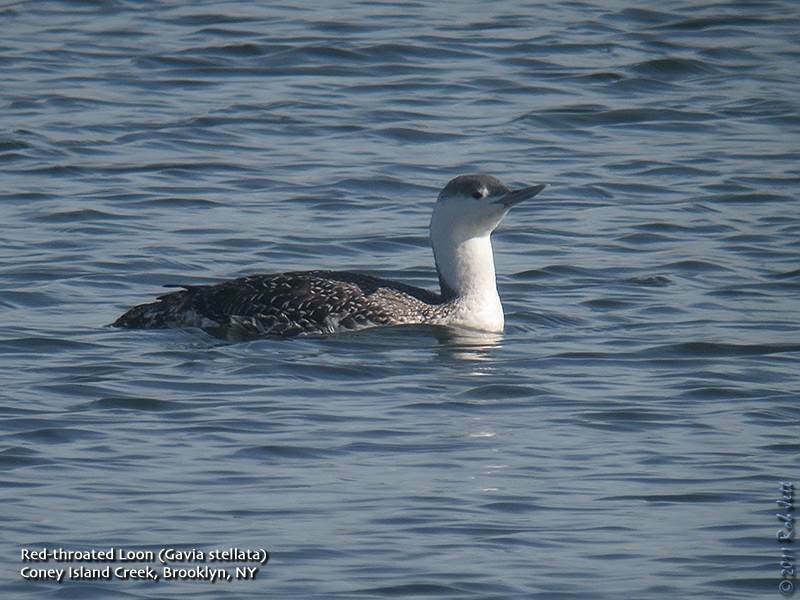 The seasons first RAZORBILL was spotted off Montauk Point Saturday and a RED-NECKED GREBE was on Fort Pond today. A CATTLE EGRET was using the back fields at the Stillwell Woods Preserve east of Syosset for a few days up to Tuesday. An ORANGE-CROWNED WARBLER was at Prospect Park Thursday and a WOOD THRUSH appeared at a small mid-Manhattan park between 45th and 46th Street on Tuesday. A decent flight today along the outer beach at Robert Moses State Park featured numbers of AMERICAN ROBINS and RED-WINGED BLACKBIRDS, 21 EASTERN BLUEBIRDS, 46 RUSTY BLACKBIRDS, 10 PURPLE FINCH and singles of PINE SISKIN, LAPLAND LONGSPUR and BALD EAGLE. 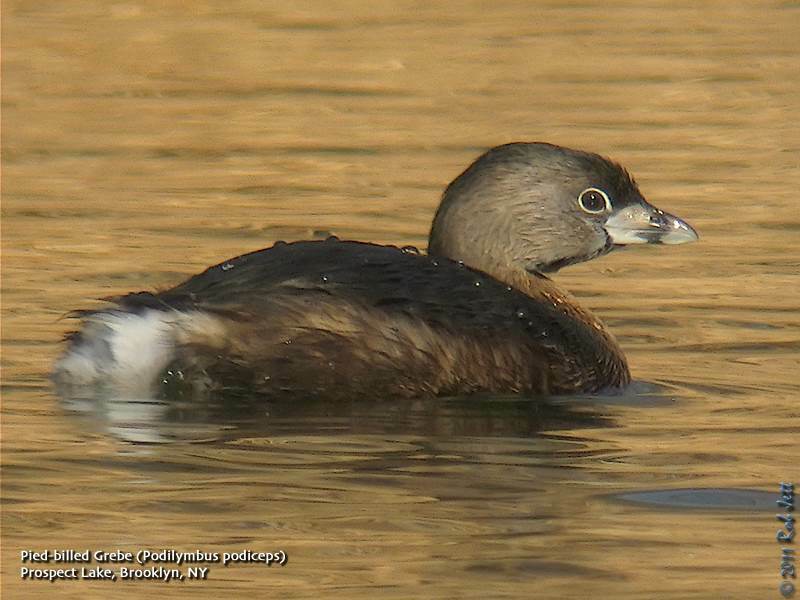 Listed as "Threated" by the New York State Department of Environmental Protection, the Pied-billed Grebe is a regular winter visitor to the city's freshwater lakes and marshes. A pair are now spending time Brooklyn's Prospect Lake and should remain through the winter provided the waterways don't completely freeze. I've been invited to participate in a really great event at New York University on Wednesday. I'll be doing a brief presentation prior to the panel discussion. Here's a link to the NYU events page (try to overlook the misspelling of my name on the website). Sunday, November 20, 2011, 10 a.m.
Instructor: Starr Saphir Even if you've never picked up a pair of binoculars, you’ll soon be identifying warblers, sparrows, waterfowl, and more. Classes adaptive to the needs and interests of students, and field trips to Jamaica Bay and Central Park. Limited to 13. $85 for package of 2 classes and 2 field trips Click here to register! Register for our van trip to the Winter Waterfowl Workshop, and get to Jamaica Bay the easy way! Transport by passenger van. Limited to 12. $20 Click here to register! Instructors: Susan Elbin, Ph.D. and John Rowden, Ph.D Join Director of Conservation Susan Elbin and Associate Director of Citizen Science John Rowden for this great opportunity to study the flying marvels we call birds, in depth and in a small-class setting. Adapted from a recent university course, Ornithology 101 will provide a fascinating survey of bird evolution, biology and behavior. Included are two field trips: The first to Central Park during fall passerine migration, and the second providing free transport to the Winter Waterfowl Workshop at Jamaica Bay NWR. Don't miss this chance to enrich your understanding of the wonderful world of birds. Limited to 12. $150 for course of 5 classes and 2 field trips. Click here to register! Guide: Don Riepe Meet at Jamaica Bay Wildlife Refuge Visitor Center for a slide ID program and walk to look for wintering waterfowl. 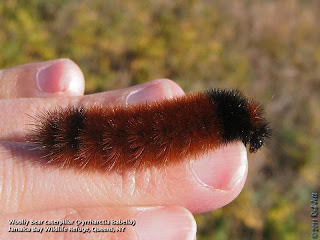 Learn about their behavior and biology, and how to identify them in the field. To register, contact Don Riepe at 718-318-9344 or donriepe [AT] gmail.com. Limited to 25. Free. Saturday, November 19, 2011, 10:00 a.m. to 2:00 p.m.
Meet at the bike path entrance on the Old Mill Road next to St. Andrews Church (the old one). We will walk to the T-junction of the bike path where we will turn up the Blue Trail and cut invasive vines that strangle saplings along the trail. If you don’t have your own, Protectors will supply gloves and pruners (& refreshments). After a two hour work session (our 185th consecutive monthly workshop), we will take a short walk over nearby trails. For more information call Don Recklies at 718-768-9036, or Chuck Perry at 718-667-1393. Greetings. This is the New York Rare Bird Alert for Friday, Eleven Eleven Eleven at 7pm. The highlights of today's tape are EARED GREBE, RUFOUS HUMMINGBIRD, BROWN PELICAN, BLACK-HEADED GULL, WESTERN KINGBIRD and several GREATER WHITE-FRONTED GEESE. 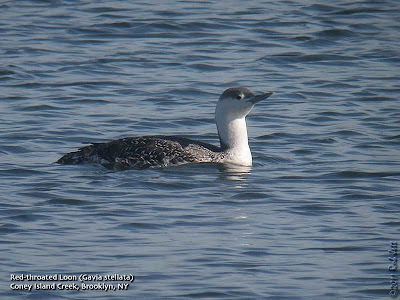 A good week for unusual birds starting it off with an EARED GREBE identified last Friday and confirmed Saturday at Jamaica Bay Wildlife Refuge. Still present at least through Tuesday the EARED GREBE has been staying with a dozen or more Horned Grebes in the bay south of the West Pond as viewed from the trail along the south side of the West Pond. As the tide drops the grebe flock can move pretty far offshore towards the islands in the bay but tends to move closer on the rising tide. A telescope is strongly recommended. Also at the bay an AMERICAN BITTERN has been frequenting the West Pond since Sunday and a growing number of ducks now include 2 REDHEADS on the West Pond. The Lenoir Preserve in Yonkers, Westchester County, has attracted another selasphorous hummingbird this appearing to be an immature female RUFOUS HUMMINGBIRD. The hummingbird has been frequenting the feeders and Pineapple Sage in the butterfly garden between the Nature Center and the hawkwatch site. The hummingbird seems to be sensitive to disturbance and may not come in if there is a good amount of activity so choose your observation point with that in mind. If entering the butterfly garden please be sure the entrance gate is firmly closed. To reach Lenoir: from the Sawmill River Parkway take Exit 9, Executive Boulevard, to its end at North Broadway, go right on North Broadway a short distance to Dudley Street on the left. The Lenoir parking lot is on the left off Dudley Street. An adult BLACK-HEADED GULL has returned as of Sunday to the Owl's Head waste water treatment plant in Bay Ridge Brooklyn near the Verrazzano Bridge. It can take patience to see the gull flying about the plant while viewing from outside the facility and finding higher ground helps. It might also be worth checking any gulls roosting on the nearby Veteran's Memorial Pier. Also in the New York City area a YELLOW-BREASTED CHAT was still frequenting Bryant Park to Wednesday when it was seen in the northwest corner of the park and a thrush believed to be a GRAY-CHEEKED THRUSH was also there. Birds Sunday at Calvert Vaux Park in Brooklyn featured ORANGE-CROWNED WARBLER, EASTERN MEADOWLARK and EASTERN BLUEBIRD. It was a good weekend for bluebirds locally as they were present at many locations. In the Bronx a GREATER WHITE-FRONTED GOOSE was on the lake at Van Cortlandt Park Thursday and today. This white-front joins at least 4 others scattered around eastern Long Island and these include 1 seen on the athletic field at East Northport High School on Monday, 1 continuing to visit Marratooka Lake off New Suffolk Avenue in Mattituck and 2 lingering on the South Fork, 1 off Further Lane in East Hampton and the other at the Deep Hollow Ranch on the south side of Route 27 east of Montauk. Also in Montauk an immature BROWN PELICAN continues to be seen along the north shoreline usually around the Montauk Harbor jetties but on Monday it was also spotted in Fort Pond Bay to the west of the Montauk Harbor entrance. On Thursday a WESTERN KINGBIRD was seen in Oldfield north of Setauket on the north shore of Suffolk County. The bird was around the Oldfield lighthouse around noon. At Montauk Point Saturday birds featured 2 adult BLACK-LEGGED KITTIWAKES but few terns were remaining while 285 COMMON LOONS were counted in Gardiner's Bay. Fourteen ROYAL TERNS were still at Georgica Pond on Sunday. Other notable gatherings of birds last Saturday included YELLOW-BREASTED CHAT, 5 BLACKPOLL WARBLERS, AMERICAN TREE SPARROW, FOX SPARROW, 5 PURPLE FINCHES and 5 RUSTY BLACKBIRDS at Caumsett State Park and at Democrat Point at the western tip of Fire Island singles of PURPLE SANDPIPER, immature LESSER BLACK-BACKED GULL and LAPLAND LONGSPUR. November is typically the month when unusual species show up around New York. Over the weekend Heydi and I spent a lot of time exploring Green-Wood Cemetery, Coney Island, Floyd Bennett Field, Dead Horse Bay, Spring Creek and Marine Park hoping to find something rare. We also took a ride over to Jamaica Bay Wildlife Refuge to chase a rare Eared Grebe. 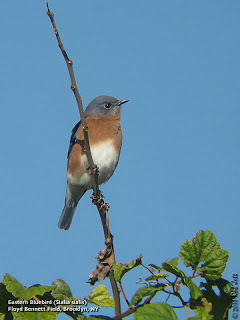 With ornamental cherry trees and hawthorns still holding lots of fruit, it was no surprise to find plenty of Eastern Bluebirds and Hermit Thrushes sticking around. Bluebirds have been seen in good numbers around NYC this season from Central Park to Floyd Bennett Field. This particular bird was feeding on the invasive porcelain berry vine. Another highly invasive species that robins and other birds seem to really enjoy is Asiatic Bittersweet. So many birds feed on the fruit of these two vines I can't imagine that conservationists could ever eradicate it from the landscape. On a positive note, I did notice that landscape designers have planted the native American Bittersweet along Highline Park in Manhattan. 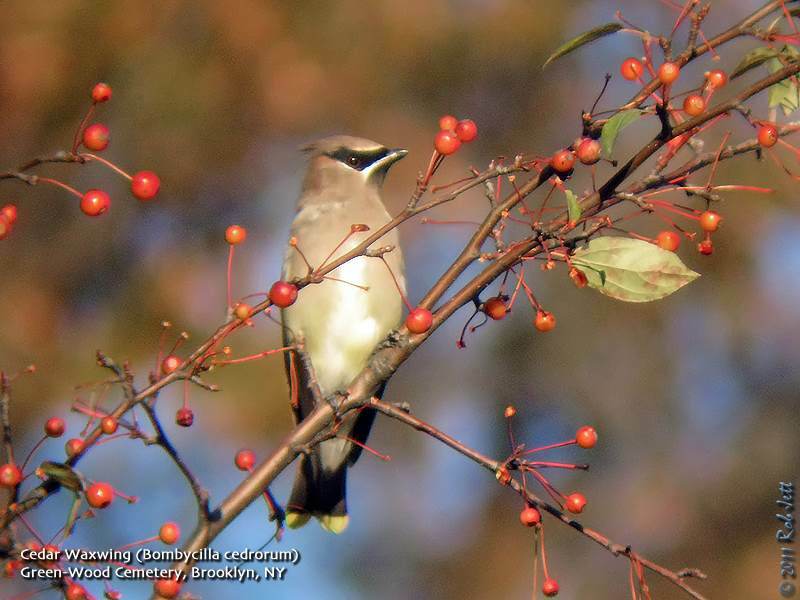 In addition to robins, bluebirds and Hermit Thrushes feeding on cherries in Green-Wood Cemetery, there has been a sudden influx of Cedar Waxwings. These hardy birds always seem to find an abundance of fruit to hold them through even the most harsh winters. There is a stand of ornamental cherry trees at the end of my block where they can usually be found feasting in mid-Winter. The bay off of Coney Island was pretty quiet. I had expected that overwintering seaducks, such as Long-tailed Ducks, scoters and eiders would have arrived, but it's still early, I guess. There were still a few dozen Laughing Gulls present on the beach among the Ring-billed Gulls, Herring Gulls and Great Black-backed Gulls. Most should be gone by the time the Christmas Bird Count rolls around. One nice surprise was to see a small flock of Black Skimmers still hanging around the beach. Many of them were juvenile birds, presumably from the large breeding colony across the bay at Breezy Point. Like the Laughing Gulls, they should be gone by mid-December. 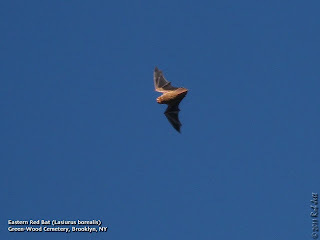 One very interesting observation was of an Eastern Red Bat in Green-Wood Cemetery. 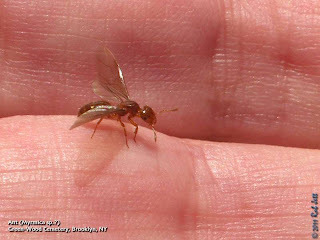 This tiny mammal was flying back and forth above a short stretch of roadway near the catacombs. It was darting and diving at some kind of insect, but they were too small for me to tell what they were. 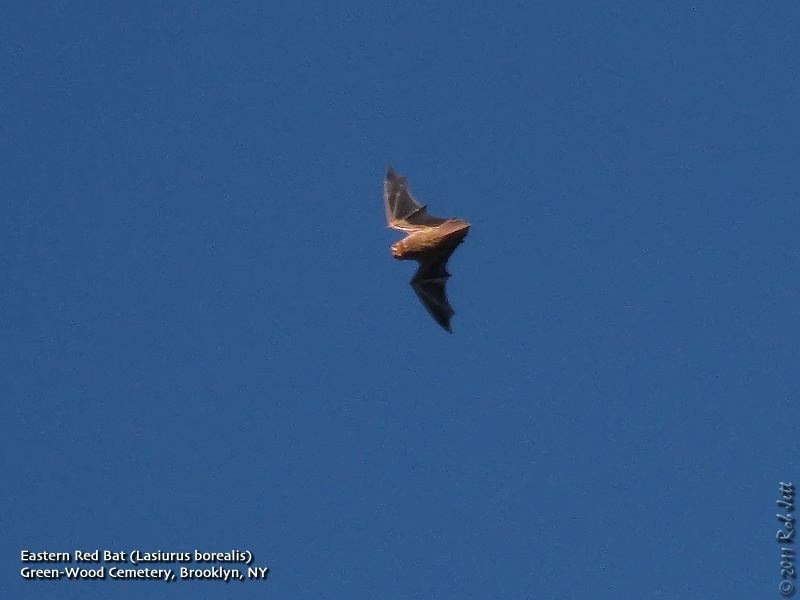 I recently learned that red bats migrate at around this time of year. Marge went back to the spot the following day but the bat was gone. 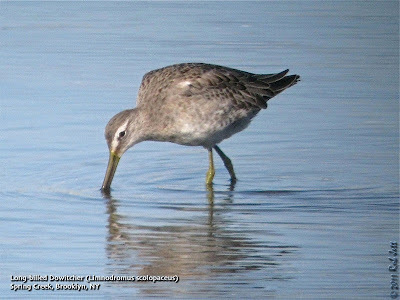 While migrating shorebirds have, for the most part, departed NYC there were four Long-billed Dowitchers still hanging around Brooklyn over the weekend. These individuals were probing for food in a low-tide exposed mudflat at Spring Creek. There were also several yellowlegs present. Here's a good article on separating Short-billed and Long-billed Dowitchers. Plastic bags will soon be a rare sight in Southampton Village stores. The ban on plastic bags passed last April takes effect Sunday, prohibiting the thin plastic bags often seen in groceries and drugstores. Plastic bags of a heavier weight, as well as those used for produce, are exempt from the ban, reports Newsday. Stores may still offer paper bags, though officials prefer that reusable bags are used. Fines for violating the law can be up to $1,000. Most residents and environmental advocates approved the ban, reports Newsday. Southampton Town's sustainability coordinator, Liz Plouff, told Patch.com in June the ultimate goal is to have consumers bringing their own bags to shop. Some other local municipalities, like East Hampton Village and Southampton Town, have started to consider the same ban on plastic bags, says Newsday. Sunday, November 13, 2011, 10 a.m. Trips start at 9 a.m. unless otherwise indicated. Please note: all phone numbers are area code 516 unless otherwise indicated. In most cases, the contacts are also leaders for the respective walks. Click Site Finder for directions. We would like to encourage carpooling, where possible. Sunday, November 13, 2011, 11 a.m. to 1 p.m. He discovered a rare sequence of 200 million year old rocks here back in 1977. He will also show you evidence that a glacier flowed over this area about 22,000 years ago. Meet on the South side of Forest Ave between Van Name and Simonson Ave.
Sunday, November 13, 2011, 5:30 p.m. to 7 p.m. Explore the dark corners of High Rock Park and search for owls with Cliff Hagen. Walk the trails at night and seek out the quiet areas that owls prefer to hunt. A bright moon will light the way, but flashlights are acceptable. Meet in the main parking lot atop Nevada Avenue. Join the annual Bill Flamm Walk out to Crooke's Point in search of migrant bird-life that section of Natural History member Bill Flamm so enjoyed. Meet in last parking area before Crooke's Point. Greetings. 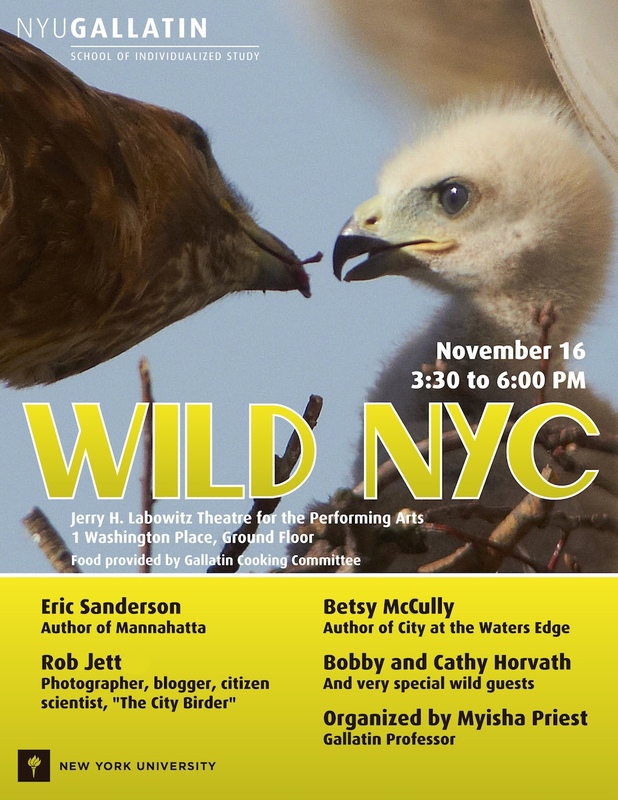 This is the New York Rare Bird Alert for Friday, November 4th, at 11:00pm. The highlights of today's tape are GREATER WHITE-FRONTED GOOSE, EURASIAN WIGEON, MARBLED GODWIT, GREAT SHEARWATER, WESTERN KINGBIRD, PROTHONOTARY WARBLER, and YELLOW-BREASTED CHAT. Thanks to the bizarre October snowstorm, a changeover in seasonal birds has quickly taken place. In the New York City area, the most unusual report was probably the WESTERN KINGBIRD, only seen briefly at Riis Park last Sunday morning. It was searched for extensively thereafter but could not be relocated. Two or three VESPER SPARROWS were present at the Fort Tilden Community Garden Sunday, and a hawk watch on a good hawk flight day at Fort Tilden featured NORTHERN GOSHAWK, RED-SHOULDERED HAWK, and BALD EAGLE, while a SHORT-EARED OWL was seen coming in off the ocean. At Jamaica Bay Wildlife Refuge, a drake EURASIAN WIGEON was spotted today on the East Pond, north of the Big John's Pond overlook, and also at the bay were a REDHEAD on the West Pond and a flyover PINE SISKIN. In other city parks, a YELLOW-BREASTED CHAT lingered for a few days, at least to Wednesday, in Bryant Park, in the front and back of the New York Public Library off Fifth Avenue. An ORANGE-CROWNED WARBLER and at least two VESPER SPARROWS visited Central Park on Tuesday, and the continuing immature RED-HEADED WOODPECKER was also seen that day. A SHORT-EARED OWL was spotted migrating over Manhattan on Monday morning. 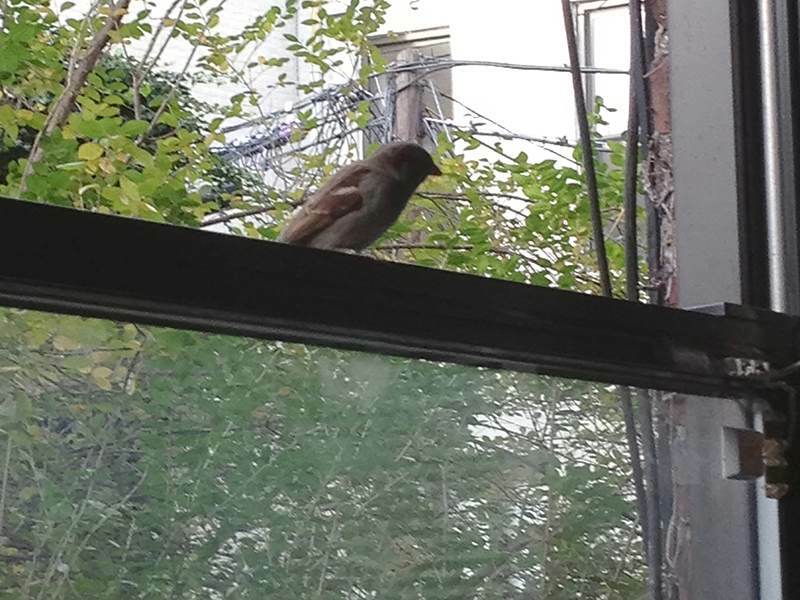 Fort Tilden had VESPER and LINCOLN SPARROWS last Monday. A PROTHONOTARY WARBLER was reported Monday at Sunken Meadow State Park, this sighting perhaps involving the same bird seen back on October 22nd. At Jones Beach West End, a lingering MARBLED GODWIT was still present Thursday on the bar off the Coast Guard Station, and good numbers of RED KNOT are among the other shorebirds gathering there. Lots of NORTHERN GANNETS are now migrating offshore. An immature LESSER BLACK-BACKED GULL was noted at Jones Beach field 6 on Tuesday. An ORANGE-CROWNED WARBLER visited Cedar Beach Marina on Monday, and that day the Fire Island hawk watch at the eastern end of Robert Moses State Park recorded a NORTHERN GOSHAWK. A LAPLAND LONGSPUR was among the landbirds migrating along Robert Moses State Park last Sunday. Decent numbers of AMERICAN PIPITS were also noted, while a good movement of seabirds offshore featured lots of scoters, RED-THROATED LOONS, and even 11 WOOD DUCKS. An AMERICAN GOLDEN-PLOVER was with the Black-bellieds just east of Heckscher State Park, field #6, on Monday. Out east, on the North Fork, a GREATER WHITE-FRONTED GOOSE was on Marratooka Lake along New Suffolk Avenue in Mattituck on Monday, along with a seasonal assortment of ducks. Another GREATER WHITE-FRONTED GOOSE was on the favored field on the north side of Further Lane in East Hampton Tuesday, where it has apparently been present for a little while. At Montauk Point last Saturday before the storm intensified, a flow of 300 or more GREAT SHEARWATERS was witnessed leaving Block Island Sound and heading for the open ocean. Also noted were an adult BLACK-LEGGED KITTIWAKE and good numbers of Forster's and Common Terns. An earlier sea watch off Amagansett produced over 13,000 scoters of three species, lots of NORTHERN GANNETS and Double-crested Cormorants, and 62 RED-THROATED LOONS. Five LESSER BLACK-BACKED GULLS were spotted between Montauk, Hook Pond, and Mecox. Shorebirds in Montauk included two AMERICAN GOLDEN-PLOVERS near Montauk Inlet and a STILT SANDPIPER off Route 27 on Saturday, and a SOLITARY SANDPIPER at Deep Hollow Ranch on Monday. 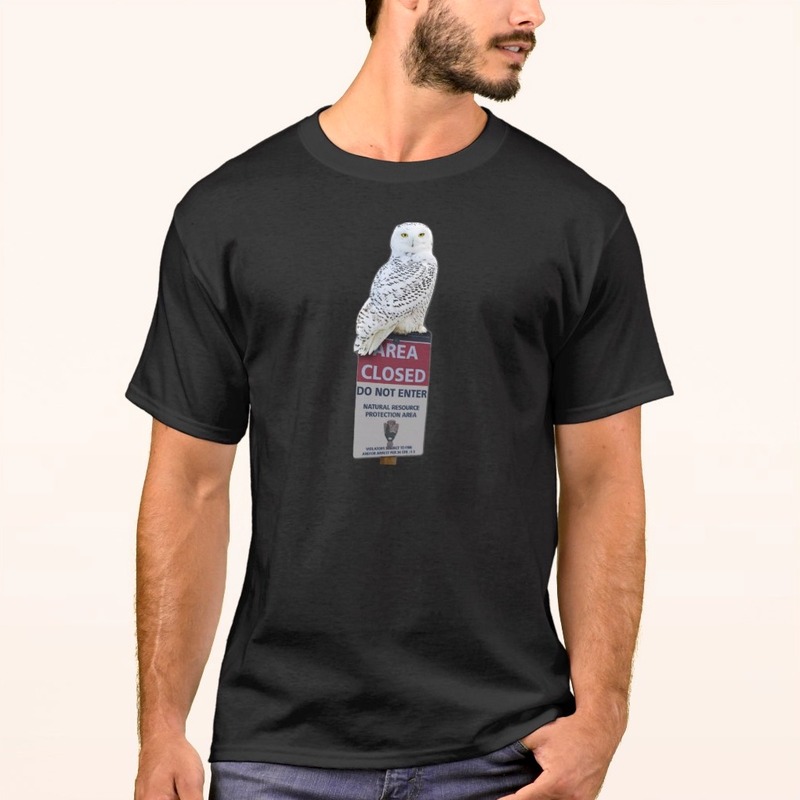 NORTHERN SAW-WHET OWLS have been appearing lately, and this is a good time to encounter a Golden Eagle or two at our regional inland hawk watches. October was a fairly productive month. With migrating sparrows being my primary focus, it should be no surprise that three of my six new species were emberizidae.. Early in the month there were still plenty of warblers moving through the area, however, with grasses and wildflowers going to seed, I expected to see a surge of sparrows. To that end I began spending more time birding around the fields of Green-Wood Cemetery, Prospect Park, Calvert Vaux Park and Floyd Bennett Field. My first new year bird of October was a Philadelphia Vireo seen in Green-Wood. Leading a trip for the Linnaean Society, I had just left a wooded hillside next to the Sylvan Water when Heydi called. She and Rich Fried were still at the hillside and spotted a Philadelphia Vireo. Rarely seen in during Spring migration, my group and I high-tailed it back to the area where the bird was cooperatively feeding in a locust tree. October 6th was a weird day in that I spotted a new sparrow in a very unexpected location...for the second time in three years. The parks department has reseeded an area of the baseball fields in Prospect Park and protected the spot with a large expanse of snow fencing. Birds quickly learn that people and dogs won't disturb them behind the fence and it is a hotspot of passerine activity. As I slowly circled the perimeter of the fenced field I tallied the following birds feeding in the grass: Northern Flicker, Eastern Phoebe, Golden-crowned Kinglet, Common Yellowthroat, Palm Warbler, Yellow-rumped Warbler, Chipping Sparrow, Savannah Sparrow, Song Sparrow, Swamp Sparrow, White-throated Sparrow, White-crowned Sparrow and Dark-eyed Junco. On my final loop I flushed a sparrow from a patch of long grass at the edge of the fence. It was a large-billed sparrow with a bright orange face and breast. 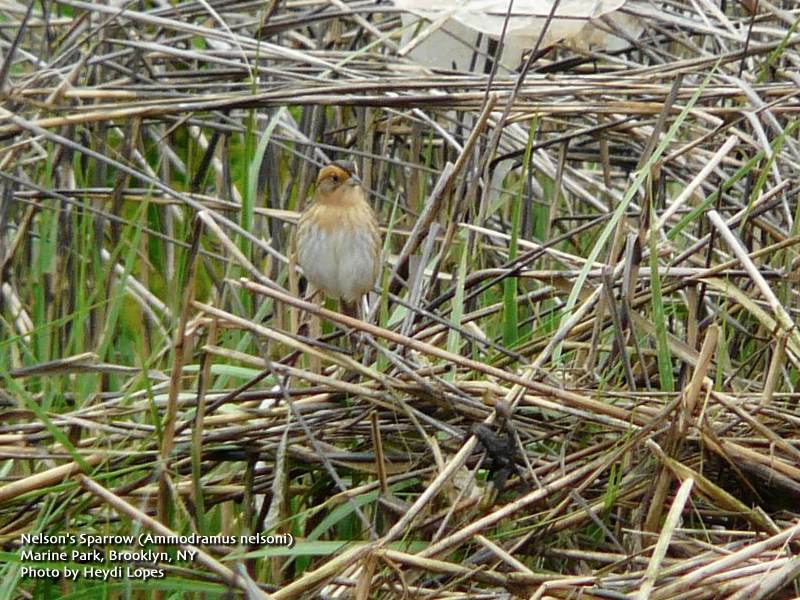 The flighty bird only flew a few yards and I was able to look over the fence at a beautiful Nelson's Sparrow. 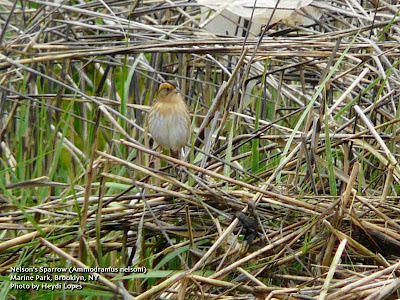 The Nelson's Sparrow is a bird of marshes and, typically, the only places to see them in Brooklyn is Plum Beach and Marine Park's saltmarsh. Oddly, this is the second time that I've seen one in Prospect Park. The first time was two years ago in a similarly fenced off area on the baseball fields. This fenced off area was also where I spotted my year Vesper Sparrow, a bird which, apparently, has enjoyed the accommodations so much, that he has stuck around for a couple of weeks. Completing my October sparrow list was a Lark Sparrow, which I spotted at a smaller enclosed area in Prospect Park, near what local birders have aptly named "The Sparrow Bowl". One non-sparrow I added in October was the Eastern Meadowlark. I usually only find this bird on the Christmas Bird Count at Floyd Bennett Field, but this brilliant yellow grassland species was spotted both at Calvert Vaux Park and Prospect Park. Finally, Heydi and I located an Orange-crowned Warbler in a weedy plot at Floyd Bennett Field's community garden. Ironically (or prophetically) it was about 10 seconds after I said, "We could still find an Orange-crowned Warbler this weekend." That means that I have seen all but one of the expected species of Eastern warblers in New York this year - Kentucky Warbler being the only exception. I ended October with 252 species in the state of New York, 242 of those in Brooklyn.